GMail introduce new priority inbox .its help you to collects emails important for you.GMail uses signal to marking your activity in email. they mark that who sent you more email and who's email you mostly opened.and which type of mail you deleted.priority inbox link is given to you left hand side of your email. If you click on that link,there are three option you see "Important and unread", "Everything else" and "starred". if priority box is fail to marking your selectivity than you can teach it by clicking "mark as a important" and "mark as not important". 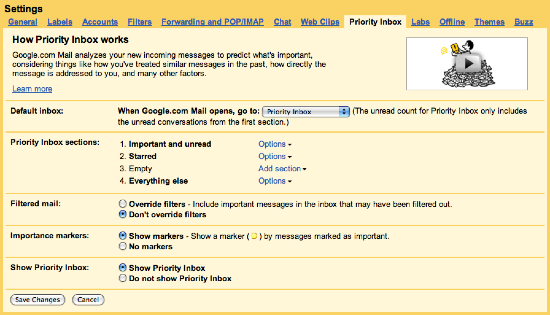 priority inbox is simple in use.just go to setting >priority inbox. there are following options given to you. default inbox:that's allows you to see what you want to see when you open GMail. priority inbox section:its for customizing your priority inbox section. filtered mail:its combine your filter system with priority inbox. important marks:to turn coloured arrows on or off. show priority inbox:select it if you want to see priority inbox or not.